I still can’t believe it is official Autumn! Where did the summer go? Now that cooler weather is upon us, I’m in the mood to decorate for fall, wear a sweatshirt and make soup! 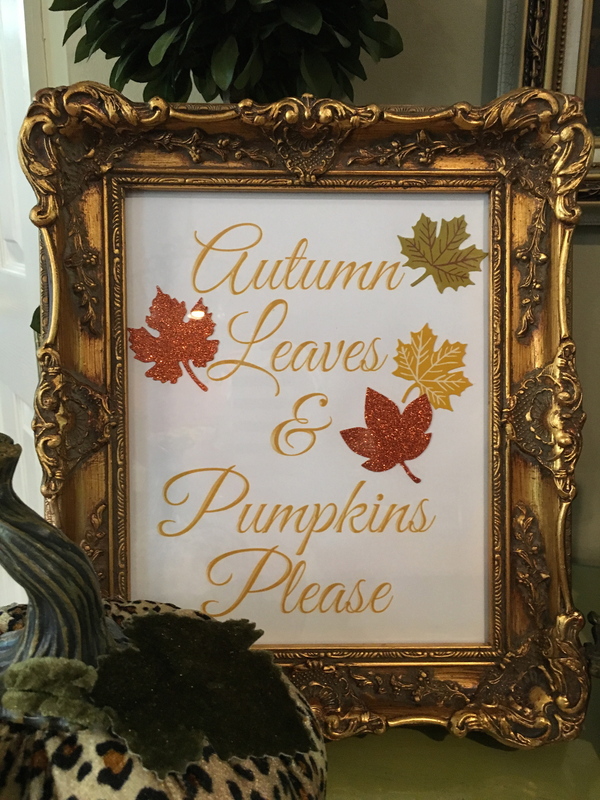 I’ve been decorating for fall for a little while now. Real pumpkins, artificial pumpkins and mums have been calling my name! Several DIY projects have been in my craft room awaiting their turn so this weekend I found a quick one! I love to buy ornate frames whenever I find a great deal. Often times I don’t know what I will use them for, but a good deal is a good deal! I bought this little gold frame about a year ago at an antique store for about $12. It is actual wood and is gold leafed. It is approximately 8″ x 10″ so it’s a great standard size for most anything. I was waiting for the perfect project for this little beauty and I found it! I found this free printable online (they are everywhere on the internet and Pinterest). It was available in gold, bronze or silver. I chose gold. Printing it out was quick and easy on our home printer. I had these pretty little glitter leaves in different colors and sizes that I purchased from Michael’s Craft Store. I arranged a few of the leaves on the printed paper until I liked the arrangement and used a glue stick to glue the leaves into place. Easy! An 8 x 10 piece of glass was on hand too, so I put the frame together and tacked a piece of cardboard on the back. I love how it turned out! Any frame would do! There was a cute saying that said, “Happy Fall, Y’all” that I liked as well. So, for less than $20 I have a fun little fall decoration for our kitchen bar! Dig through your stash and I bet you have an old frame too! If you are extra ambitious and crafty you could make your own leaves too. Happy DIY Monday! Dear Craigslist, I love you. New Appliances for Valentine’s Day! Whip your fridge into shape!